*An initial meeting with the owners or farm manager to learn about alpacas in general, the history of the ranch and specifics on your alpaca. This is truly a fantastic gift for any one, any age and one that keeps on giving for an entire year! The smile that alpaca gifts to you through your adoption of them is a priceless commodity that will never be forgotten and always cherished. Before you make your decision we ask that you please read the following FAQ's. So does it mean we own the alpaca? Unfortunately not. Those that choose to adopt do not have any ownership rights to their alpaca. The money you spend on the alpaca is instead put towards the upkeep of them, ensuring they have the best of everything available to them. Is it possible to take the alpaca off ranch property to show friends and family? Again, no. 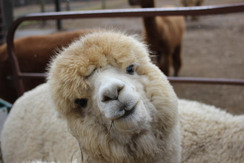 You will be allowed to meet with your alpaca and walk them around the property (after being properly trained) but you unfortunately cannot walk them off the ranch. How often can I visit my alpaca? We offer in our package access to your alpaca on the weekends however, there is no guarantee that it can happen every weekend and more than likely, due to shows and other events in the alpaca's lives, there will be times where we have to say that they cannot meet with you. We guarantee at least one visit per month and assure you that for the majority of the weekends throughout the year your alpaca will be available to you. We will always keep you updated as best we can on which weekends they will not be available to see you. We do encourage you to visit often as the more an alpaca sees you, the more comfortable around you they will become. When I visit, how long do I get to spend with my alpaca? That depends on how social your alpaca is feeling that day. 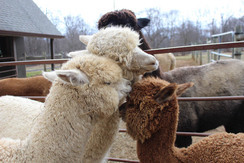 We invite you to stay at the ranch for as long as you like but generally the interaction time with your alpaca will range from anywhere between 30-60 minutes per visit. 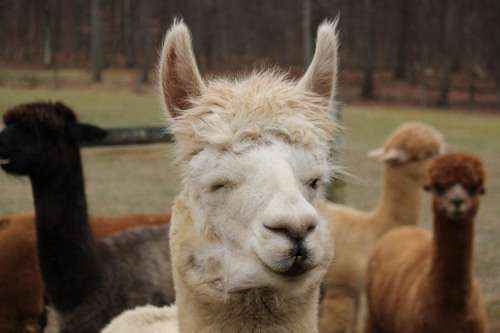 Alpacas are essentially herd animals so they do not like to be isolated for long periods of time. What if something happens to my alpaca throughout the year? Although we certainly don't wish to think about such things, if something should happen to your alpaca we will happily allow you to choose another to adopt. Am I allowed to bring friends to meet the alpaca? Absolutely! Just please remember that alpacas can be rather shy and skittish so if a large group suddenly descends on them, they might be less inclined to interact. 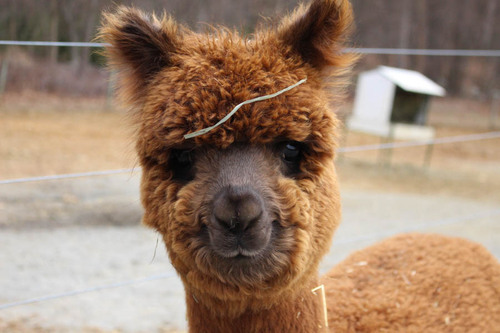 How do I arrange time to see my alpaca and does someone from the ranch have to be there with me? We ask that you please give us 72 hours notice before a weekend visit either via email or calling and speaking to someone at the ranch. This ensures that we can have your alpaca ready for your visit and have someone there with you for the duration of your time with your alpaca. So yes, someone from the ranch must be with you when you are visiting your alpaca. 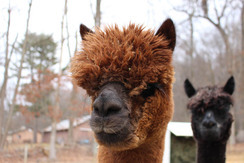 Alpacas are expensive commodities and we want to make sure that they are kept safe and to also remove any form of responsibility from you should anything happen on your visit. Will there be any formal training on how to handle an alpaca? Over your first visits you will be instructed on how to halter the alpaca, walk with them and generally care for them. You will not be allowed to walk them without assistance until you have had those three training sessions. Now that you have read through the questions that we often get, you are probably wondering how you go about selecting an alpaca and then proceeding with the adoption. 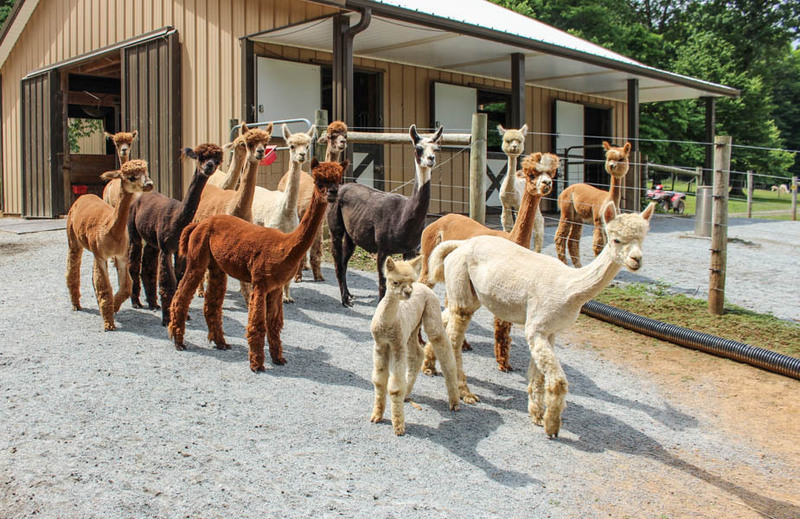 Picking your alpaca: Just click 'Our Herd' tab above, look at the alpacas we have at the ranch and decide which one you would like to adopt. There will be alpacas listed that will say in their bio 'Not For Adoption', so please keep an eye out for that. We would also like to remind people that even though the yearlings of the herd are an obvious favorite to adopt as they are so cute and cuddly, they will always tend to be on the shy side and reluctant to leave their mothers side. This means that your time with them will be at first, more observation based. After six months they will be getting used to halter training so you will have more interactions with them. Past a year, how they interact with humans in general will really depend on their personalities and we do try and highlight which ones are more receptive to human interaction in their bios. 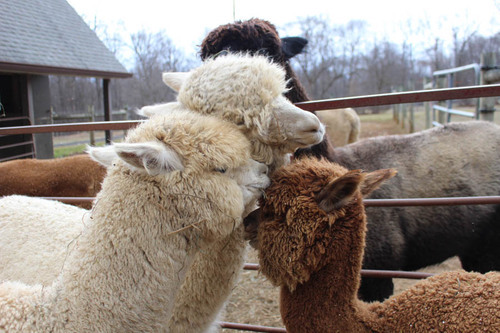 It's best to keep in mind that just like people, every alpaca is different. Some are more cautious around humans while others are happy to come right up for a quick cuddle and kiss. Finalizing your adoption: Once you have picked your alpaca, email us at highlandairsalpacaranch@gmail.com and tell us your choice. We will then send you the registration form needed to be completed and give you more detail on your choice of alpaca just to make sure they're a good fit for you. Once this is done, payment is taken and we will send you all the goodies that come with your adoption of an alpaca and set up a time for your first visit. We very much look forward to hearing from you and know that you or your loved one will find immense joy and happiness in adopting an alpaca!